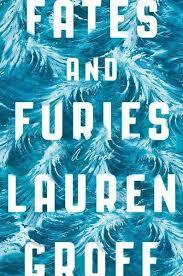 I may be late to the party, since Lauren Groff's novel Fates and Furies has been out awhile, but it's one of the books I've enjoyed this year that lived up to its promise. The rule of thumb for how long one must keep reading a book before giving up on it is 100 pages minus your age. Many times I've been rewarded for hanging in there when a book is a slow start. 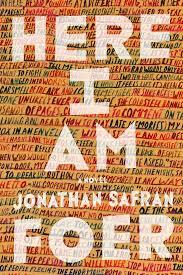 This book, however, drew me in quickly, not just with the story and the characters but the writing. Divided into two parts (Fates and Furies--hence the title), the novel begins with the marriage of Lancelot ("Lotto") Satterwhite and his wife Mathilde at 22, just days after they first meet. Groff tells what could be considered a full story, tracing Lotto's life from before his birth, when his mother performing as a mermaid in Florida meets and marries his father, who becomes a bottled water magnate. The story follows twists and turns in their marriage, as Lotto fails to fulfill his early promise as an actor but finds success as a playwright. Geoff bring in and out of the story a large cast of characters--childhood friends, Lotto's agoraphobic mother, the twin brother of his first lover, college friends. When the story shifts in the second half to Mathilde's life, readers may be surprised not only how much they didn't know about her, but how we failed even to be curious about her back story, just as fascinating as his, maybe more. When Groff weaves in the details of the famous art forger who, during WWII, fooled even Hitler's inner circle by painting his faux Vermeers over mediocre works on ancient canvases, it seems obvious that she overlays Mathilde's story over Lotto's. Even before exploring the mythological allusions the title implies, I was drawn into the story with its surprises which I realize, on retrospect, were always laid out perfectly through the telling of this story of love, deceit, and revenge. Often my reading list is dictated not by mere whim but by the selections of others. Since I enjoy the social aspects of reading either with friends or in book clubs, I will often read a book I might not have otherwise chosen. And that's a good thing. All too often, I'm the one assigning the texts, so turn about is fair play. I know that no matter how hard I try to choose a book that is suitable for a wide readership, someone is going to hate it. Sometimes the readings align in an interesting way. This semester for the literature class I've been teaching as an adjunct for the community college, I was assigned a novel to teach, Maisie Dobbs, a novel set during and after World War I in England. Around the same time, my daytime book club has been reading a World War II novel, The Lilac Girls by Martha Hall Kelly, and my evening book club is reading Chris Cleaves' novel (also World War II London) Everyone Brave Is Forgiven. My attitude toward Maisie Dobbs could have been better. It felt too lightweight for me, and I longed for a little more literary richness. The title character is likeable, even admirable, a girl born into lower working class who advances first through reading. When the wealthy, albeit liberated, woman for whom she works discovers her in the family library reading in the wee hours before her work begins, the woman gives her the breaks that make advancement possible. The book moves from the present, with Maisie working as a detective and using skills she learned from her mentor, to the past as she leaves college to volunteer during the war. I used one of my favorite strategies in my class after the students finished the novel, with the students leading the discussion as I silently observed. They brought the reading to life, not only having a lively discussion of the plot but going on, with no prompting from me, to discuss the writer's choices. I haven't met to discuss the two book club selections yet, but as I read The Lilac Girls, I struggled. Wells follows three main characters: Caroline, a privileged socialite living in New York and working with the French Embassy before the United States enters the second world war; Kasia, a young Polish girl arrested and sent to Ravensbruck for her involvement in the underground; and Herta, a German doctor who works on some of the horrific medical experiments on the female prisoners at Ravensbruck. The story was so full of descriptive details and historical information that I suspected the author had heavily researched the period and couldn't let go of any of it. My biggest problem, though, was that I disliked the characters. Certainly, it was easy not to like Herta, but even Caroline, the do-gooder, drove me crazy with her vacuous observations, and especially her pining away for her married French lover. It's hard to sympathize with a girl who feels a little let down to learn that her lover's wife didn't actually die in the concentration camps after all. Even Kasia, certainly a victim, had such a bitterness that she hurt others as much as she hurt herself. At the end of the book, though, the author fills in the reader on how she wrote the book, based on real characters. Caroline was real, actually admirable; her French lover was a fictional plot device. Herta was real--and she was actually released early before she completed her twenty-year sentence, thanks in part to some political maneuvering by the U.S. government. Kasia and her sister, though invented characters, was based on actual sisters held at Ravensbruck. I'm glad she told me her background into the book. It made me a little more forgiving of what I might otherwise have found annoying. She also made me want to read more about these Ravensbruck girls and about the real Caroline Ferriday. Of the three stories of women during wartime, my favorite was Everyone Brave Is Forgiven by Chris Cleaves. I fell in love with his writing when I discovered Little Bee, with one of the most engaging narrators ever. In this book, the protagonist Mary North is also a young woman of privilege, but against her parents' wishes, she enlists soon after the war begins, but is surprised to be assigned to teach school children. When her students are evacuated, her approach to her students leads to her being sent back to London. There she meets her first lover Tom, head of the local school board and not at all in her social league. The plot also follows Alistair, Tom's roommate who does go to war. Cleaves manages to develop characters that are both flawed and sympathetic. They have a self-awareness that adds to their charm and believability. The author also builds some of the most suspenseful scenes with a small cast of characters, not only on the battlefield, but back in London during the bombings. This is a story I can't wait to talk about at book club--and it's one I can't wait to recommend to anyone who loves a good story well told. Toward the end of the calendar year, I’m always thinking back on all the books I’ve read during the year, trying to decide which I liked best, which I would recommend to whom, which I would read again. Whenever online book sites try to recommend books for me based on what I’ve bought from them, I have to laugh. I don’t think there is an algorithm to decipher my reading preferences. I prefer literary fiction, but I read all kinds of books--autobiography, lots of poetry, spirituality, self-improvement. I will confess, too, that I while I am a picky reader, I am no reading purist. Yes, I love to hold a book in my hands, to turn the pages, to write in the margins, but I also keep a book going on my iPad all the time, along with one in the CD player of my car. Just give me stories; just give me words. 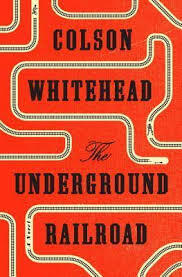 I still have several books I plan to mention in coming posts, but I just finished Colson Whitehead’s The Underground Railroad, so I must share. I heard Whitehead speak at Parnassus Books a few weeks ago and found him an engaging, entertaining speaker. I particularly liked his premise, writing about the Underground Railroad the way he imagined it as a child—a real train running on underground tracks. Ann Patchett, when asked who would win the Pulitzer Prize this year, predicted this one would "win it all." Whitehead begins the book in Georgia, where Cora, a slave who still resents her own mother for running and leaving her behind, is invited to escape with Caesar, another slave on the same plantation, purchased after his Virginia owner died, failing make good on her promise to free him at her death. The master's death has left them in the hands of a particularly cruel son. Things can only get worse. The two go first to South Carolina, deceptively safe for awhile. She works first in the home of a local family, and then at the history museum’s live exhibit, sometimes reenacting live on the plantation, sometimes on the slave ship. Then her past threatens to catch up with her. Their next stop takes them to North Carolina, where state laws have recently closed the doors on all blacks, free or slaves, with a gruesome Friday night ritual she witnesses from the attic where she hides, virtually enslaved again. Always just over her shoulder is the infamous slave catcher still bitter over failure to find and return Cora’s mother. Eluding him, she ends up in Indiana at a rather Utopian community of blacks, some freedmen, some mixed race members who have, at times, passed as white, and many former slaves. Whitehead manages to weave in the first person accounts of others in Cora’s story, filling in pieces along the way. His final product is the story of one slave that translates to the story of all slaves, balancing hope and hatred, the past and the future. Those who played a role in the real underground railroad become three-dimensional characters who might be our own neighbors. They might be ourselves. I suspect the story will haunt me for a long, long time. Some books are a harder sell, particularly when the subject matter seems so dark and cheerless. I know that I lean toward fiction already, so when someone recommends a work of nonfiction written by a doctor diagnosed with cancer, the recommendation has to come from some powerful directions. Fortunately, the reading friends who suggested Paul Kalanithi's memoir When Breath Becomes Air had an excellent track record. Kalanithi opens the book with his suspicions and diagnoses of lung cancer, already metastasized, during his final year of residency, where he trained as a brain surgeon. He confesses that his marriage was already under a strain because of the hours devoted to his training. Then he takes readers back into his early developmental years that made him the man he became. The son of a doctor, he didn't plan to go into medicine. Once he entered college--a prestigious Ivy League school--he double majored, adding a literature degree to his pre-med studies. Kalanithi's love of language won me over quickly, particularly his awareness of how language defines who we are. This sensitivity he brought into his medical career, remaining acutely aware of the choices his patients faced, the choice he had to treat patients and their families impersonally or to communicate in the most humane fashion. Through his ordeal, he shared the reality when the doctor becomes the patient. His doctors presented him with his options, giving him their support to finish his education and to consider a future. He and his wife also opted to have a child--a daughter--even knowing how little time he would be able to spend with her. Ultimately, his realistic appraisal of the amount of time remaining led him to write this book, even when he required special gloves to protect his skin as he typed on his laptop. 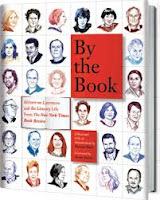 In many ways, the book is incomplete--at least in the way any story is, when the narrator's exit comes before The End; however, his wife Lucy, also a physician, provides an afterword that pays a beautiful tribute to her husband and the grace with which he lived out his final days. Through his humanity, his faith, his practicality, Paul Kalanithi faces his own death with grace and acceptance, leaving behind an example for how to live and how to die. I became a fan of Ann Patchett's fiction long before I moved to Nashville. In fact, after I read Bel Canto, the first book of hers to come across my radar, I wrote a review that was published in English Journal, the secondary education professional publication of the National Council of Teachers of English. What I found in that book was a work of literary fiction I could recommend to readers who wanted a suspense novel. The novel and its characters stuck with me the way many books never do. Since then, I have read everything Patchett writes, fiction or nonfiction. When she joined partner Karen Hayes to open Parnassus Books in Green Hills after Davis-Kidd closed, I always looked forward to trips to Nashville. This independent bookstore was a nice size with a healthy book to other stuff ratio. Obviously, the employees didn't just work there; they loved books. They talked books. Upon moving to Nashville, I got my library card just a few blocks from Parnassus, but I headed to tho the bookstore often enough to purchase books I needed to own, not just to read. 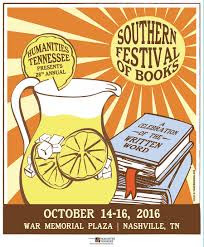 Then I discovered Salon@615, a library partnership with the bookstore that presents so many great writers at their frequent events. Last week, the author was Ann Patchett, debuting her new novel Commonwealth. She was getting ready to start her book tour (beginning at the airport bookstore the next morning before flying out of town. She certainly gave her audience a nice preview to the novel, reading from it and talking about how it was different from and similar to her other books. Then she started giving suggestions of other people's books. I had my pen poised and ready. She always has a book she's revived and is sharing with others. Right now, it's Lucy Dawson's Dogs as I See them, from the 1930s. It was for sale on the table right alongside Patchett's in the lobby. She also predicted that Colson Whitehead's The Underground Railroad, the current Oprah Book Club selection, will win everything this year--Pulitzer, National Book Award, everything. She also mentioned his earlier book The Intuitionist, which she also loved. Other favorites this year she mentioned several authors whose earlier books I'd loved--My Name Is Lucy Barton by Elizabeth Stout (Olive Kitteredge) and A Gentleman in Moscow by Amor Towles (Rules of Civility). 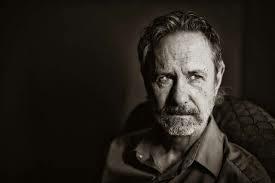 Discussing Whitehead's novel, Matthew Desmond's Evicted, and others, Patchett referred to what she calls the "Hamilton Principle": an author takes a story--World War II and the Holocaust, slavery--we all think we know and makes it new and fresh. She also recommended Louise Erdrich's new novel La Rose. Earlier in her talk, Patchett had admitted that all her books are really the amen book: a group of strangers are thrown together in an isolate place and form a family. Erdrich has a formula too, she said: something unspeakable always happens in the first eight pages, and the rest of the book deals with it. She also said that one of her favorite recent novels was Jane Hamilton's The Excellent Lombards, her most autobiographical novel so far. She also mentioned Elena Ferrant's Neapolitan novels, a quartet beginning with My Brilliant Friend. She said that anyone buying the first one must also buy the second because you will "go down that rabbit hole" and not come up until you've finished them all. She says after finishing the first one, you will have to start the next one immediately. She also recommended Edward St. Albans' Patrick Melrose novels. Among the nonfiction she mentioned were Susan Faludi's In the Dark Room (and she also recommended her earlier book Backlash), Hope Jahren's Lab Girl, and When Breath Becomes Air by Paul Kalanithi. I left the reading clutching my new hot-off-the-press copy of Commonwealth, a bigger reading list than ever, and a new friend I met in line. I couldn't be happier. Recently at a dinner party with a particularly congenial group of friends, someone suggested we needed a book club. Even though some of us are already part of a book group that meets during the day, several of the women's work schedules don't allow for daytime meetings, so we decided to try an evening group too. Tonight we have our inaugural meeting at the home of one of the women, so I'm thinking a lot about how to get started on the right foot. I know some of the problems with keeping a group going--scheduling conflicts, book selections, too much focus on the refreshments, life in general. I also know how rewarding friendships can be when they revolve around reading for pleasure and mental stimulation. I wish I'd cut out the article by a former book editor for the Charlotte Observer who said that while her husband read, he didn't want to discuss his reading with her. (He does not, she complained, "give good book.") I love book talk. One of the greatest pleasure after reading a good book (or any book for that matter) is discussing it with someone else. What books are currently on your nightstand? Which books might we be surprised to find on your shelves? And what’s the last truly great book you read? Whom do you consider the most overlooked or underappreciated writers? What kinds of stories are you drawn to? And steer clear of? And what are your favorite books of all time? What’s the best love story you’ve ever read? Is there a certain type of book you try to steer clear of as a reader? And a type of story you’re drawn to? What kind of reader were you as a child? Have you ever gotten in trouble for reading a book? What was the last book to make you laugh? The last book that made you furious? If you could meet any author, dead or living, who would it be and why? What’s one book you wish someone else would write? Which books are you embarrassed not to have read yet? What book do you find yourself returning to again and again? I love it when I'm reading a book and can hardly finish it for wanting to talk to someone else about it. 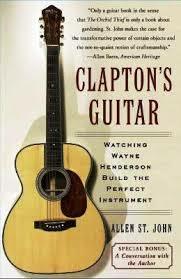 That's exactly how I felt while reading Clapton's Guitar, journalist Allen St. John's story of convincing Virginia musician and guitar builder Wayne Henderson to complete the guitar he'd had on order for at least a couple of years for Eric Clapton. I'd heard Henderson play while living in North Carolina, and at the most recent MerleFest at the "Mando Mania" session, as the artists discussed their mandolins, one was a Wayne Henderson model. What readers never learn is whether St. John eventually got a coveted guitar for himself from the master builder. In the book, though, he describes the process and the workshop in such detail I felt as if I had been there with the men--and yes, he realizes, this is almost exclusively a boys' club. The people who come in and out of the workshop by Henderson's home are the jokers and story tellers, the neighbors and festival planners. Along the way, St. John also clearly distinguishes old time music from bluegrass, and both from anything else. I found myself building a playlist as I read, since he refers not only to the tunes I know best, "Blackberry Blossom" or "Deep River Blues," but other tunes one would be more likely to hear at a fiddler's convention than at Carnegie Hall--both of which Henderson plays. Through the book, I developed a new respect for luthiers and a broader knowledge of the history of Martin guitars. The footnotes were interesting too. For example, I learned that Nazareth, mentioned in the Band's best known song, "The Weight," refers not to the town where Jesus was born, but the Pennsylvania town where the Martin factory is located. I read the electronic version of the book, but I'd recommend the paper copy for anyone who wants easier access to the extensive glossary. I also kept flipping back to the opening pages, where he includes a clearly labeled graphic of a guitar. The book, though technical in many ways, is infinitely readable, developing a wide cast of characters set in a unique setting. For good measure, he includes a buzzard and possum story one won't forget soon. 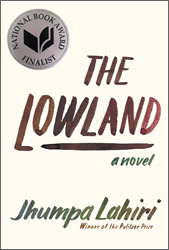 Some of the stories from Jhumpa Lahiri's story collection Unaccustomed Earth still haunt me, so I was eager to immerse myself in her most recent novel, The Lowland. This book opens in a village outside of Calcutta in the late 60s, with two brothers Subhash and Udyan who live just outside the wall of an exclusive golf club. While Udyan becomes involved in the political movement Naxilism, Subhash moves to the United States for his education, and their lives take diverse paths. Lahiri present the narrative from the points of view of Udyan, his wife Gauri, widowed after Udyan's involvement leads to his death, and Bela, their child he never knew, but the older brother Subhash remains the main focus of the story. After finishing school, Subhash remains in Rhode Island, rarely returning to his childhood home and failing to live up to his parents' expectations. Instead, he marries Gauri to save her from her secluded live with his disapproving parents and raises his brother's daughter as his own child. Since much of the story takes place in the United States during the Vietnam war, readers may be surprised to realize that the unrest in India at the same time failed to register on the American consciousness. Lahiri weaves a story steeped in diverse cultures, yet produces characters with universal struggles--coming to terms with disappointment in others and oneself, telling and accepting truth, finding love. The story with its embedded flashbacks comes together like a puzzle, and despite all the personal conflict between the characters, Lahiri draws them with such shades of dark and light that readers don't have to choose sides. I found myself wishing redemption for them all. 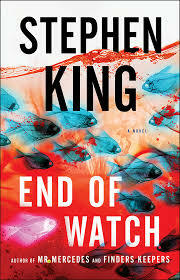 I'll confess that I'm not one of those readers who gobbles up everything Stephen King writes. In fact, the first novel of his I read was Misery, back during the Iran Contra hearings on television while I was home with a new baby. I liked his writing, but there were so many books on my list, I didn't get hooked. Then I read his excellent book on writing. It was one of those most borrowed (or stolen) from my classroom book shelf. After November 22, 1963, I had to admit that King was as varied as he was prolific. Then I started Mr. Mercedes. I don't know what led me to choose this one--in audio at the library, but I immediately loved Hodges, the retired detective at the center of the story and Jerome and Holly, the unlikely sidekicks he picks up along the way to solving the horrific City Center event when a driver plowed into a huge crowd of people camping out at an employment fair. When Finders, Keepers, the sequel came out, I was on the waiting list again. I loved the technologically challenged, aging detective, his partner, the socially inept but computer savvy Holly and Jerome, originally the teenager who does Hodges' yard work, but eventually tackles his computer issues. With the publication of the final book in the trilogy, King made an appearance in Nashville. The event tickets were snapped up in four minutes. I didn't get any. But I happened into the library when the book was on the "Lucky Day" shelf--new releases available for 14 days only. In this book, the Mr. Mercedes killer is still in the brain damage ward of the local hospital, but Hodges' partners have stages in intervention, convincing him to quit visiting Brady Hartsfield, whom he suspects is faking to avoid prosecution. When one of the seriously injured City Center victims and her mother are found dead of apparent suicide, Hodges' former partner, about to retire himself, calls him in for his opinion. The novel that results balances 95% realism with that 5% creepy supernatural King does so well. Using retro handheld game devices, someone (Hodges suspects Hartsfield) is setting off a rash of successful and attempted suicides. I was glad I kept reading through the epilogue and acknowledgments, where King points out to readers that while the story is fiction, suicide is real and serious. He provides the suicide hotline number and encouragement for anyone considering suicide to give things time to get better because, as he points out, they eventually do. While I felt the ticking of the clock as I power read the book, trying to finish it in time to return it to the library for the next lucky reader, I lost myself in a well-told story. I'm missing Hodges and his friends already. Labels: Books, End of Watch, Mr. Mercedes, reading, Stephen King, suicide. to Go Set the Watchman, I'd suggest Truman Capote's wonderful short story "Christmas Memory"
a split second before we recognize a bit of ourselves in them. is to listen to a recording of the author reading it! everyone needs to read to be fully human. I can't say I disagree. Mattie Riggsby gets stuck in the chair), I read everything else he wrote. I still do. but his short stories are pitch perfect. This one is the first story in his collection Burning Bright. while to read. Then it stuck in my head. Forever. for the Crack of Dawn is, hands down, my favorite. 9. Tony Earley, Jim, the Boy This book with a young protagonist was just a perfect novel to me. someone else who has read it. re-read it along with my students year after year and never tired of it. Man first and loved it. I'm glad I got to this one too. 12. Pat Conroy, Prince of Tides I love all of Conroy's big, wordy novels, but this one I read first. Wide. I'm sad there won't be any more. I could start right now thinking of other Southern writers and books I should have included. I should tell you the ones to watch for: Shari Smith', Susan Yergler-Bradburn, Wiley Cash, Ann Patchet, and lots more appearing soon at a bookstore near you! 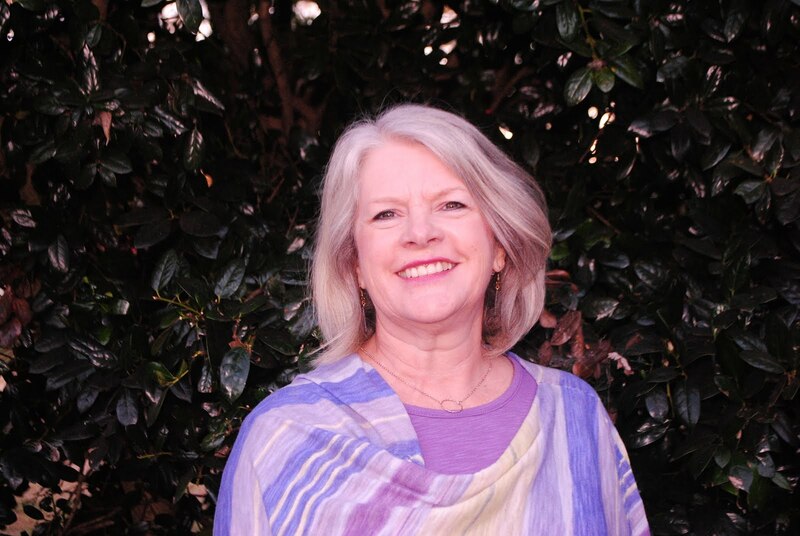 I just saw a post "My Assignment: Pick 12 Southern Writers" from Dannye Romine Powell, poet and long-time columnist for the Charlotte Observer, announcing that she had been asked by a by a local book club to recommend works by Southern writers. She shares her list, which includes some works I've read (such as Eudora Welty's short story "A Worn Path" which came up in a conversation I had today) some works I haven't read by authors I have (Josephine Humphreys, for example), and others with which I was unfamiliar. She finishes with a mention of a short list of writers she'd omitted--in this particular list at least: William Faulkner, Walker Percy, Pat Conroy. Anyone knows--Powell knows--such list a highly debatable. Isn't that what makes them fun? I'm going to take a day or two for my own list I would have assigned to the same request, but I'd love to hear yours. Readers may be as tired of hearing about my move as I am of the process itself, but the ongoing experience of unpacking and the discovery that results has provided opportunity to muse on certain life concepts. The biggest challenge centers first on what to keep, what to give or throw away; now, though, I am making decisions about what to leave stored in boxes and what to place within reach. I came across a Pampered Chef ice shaver I've had for years and used just once--just in time to entertain my grandsons who are visiting for the week. Now that I have a few sets of book shelves installed in what can still be called "the box room," I have made the hard decisions about which books earn a spot. Do I shelve the ones I have read and loved, the ones to which I return as references, or the ones I hope to read next? I did a little of all three. 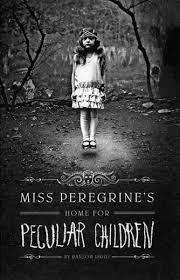 As I finished one book and selected another, in this case for a trip to the beach, I came across Miss Peregrine's Home for Peculiar Children, a book that I've owned since its publication. I came across it at the NCTE annual convention, where I often discovered good books. I'll confess, I judged the book by its cover. I was drawn to the old black and white photograph of the little girl who, on close observation, appears to be levitating. The book starts far from the home mentioned in the title, as Jacob, sixteen-year-old boy, responds to a frantic call from his grandfather and finds him in the woods behind his house the victim of a deadly attack. In the aftermath, Jacob suffers from nightmares and spends time with a counselor. Going through his grandfather's collection of letters and photographs, he is drawn to visit the English island where the man had been sent as a boy escaping the Nazis. Once he and his father reach the isolated island, he finds himself moving back and forth in time, meeting all the "peculiar" children who lived in the home with his grandfather before the man chose to leave to fight against the German forces in WWII. At this point, author Ransom Riggs moves back and forth between realism and fantasy as Jacob is drawn into the challenge facing the children who have been living and reliving the same day the island was bombed by Nazi forces. The conclusion begs for a sequel, and since I waited to read the book, I don't have to wait for the sequel to be written. I particularly look forward to the photographs, which I learned at the end of the book, are real photographs from several collections. My first instinct is to start looking for this kind of photos at antique stores. But then I'd have to find somewhere to store them. LaRose: Louise Erdrich's New Tale of Families Entwined. Since it's already June, I plan to play catch up posting about my summer reading so far. 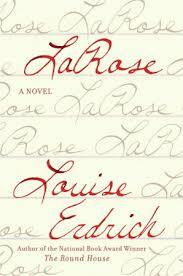 I'm going in reverse (or random) order though because I can't wait to discuss Louise Erdrich's latest novel, LaRose. I've read lots of Erdrich's writing--novels and short stories--over the years. 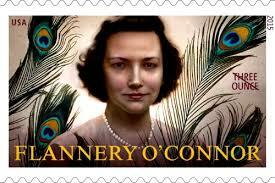 Several of her stories were in literature anthologies I taught. She writes the kind of Native American literature, like Sherman Alexie, that remains true to the culture while touching such universal cords. One of the benefits of living in Nashville is the frequency of author readings. The Nashville Public Library presents Salon@615 regularly, with special thanks to Parnassus Books, the wonderful store author Ann Patchett owns with partner Karen Hayes. In May Erdrich appeared with author Jane Hamilton, another favorite of mine. Their tag-team reading, discussion, and Q&A were such fun. I had already started reading LaRose, and her reading from a later chapter made me eager to get back to the book. The book opens with a tragic hunting accident by Landreaux Iron, killing the five-year-old son of his neighbor Peter Ravich and his wife, sister to Landreaux's wife Emmaline. Following "the old ways," the Irons bring their own five-year-old son LaRose to the Raviches, a trade that separates the two couples but brings their children closer. This book demands a slow thoughtful read, particularly by anyone interested in writing, because of the deft way Erdrich handles the chronology of the tale. She moves back and forth, bringing in the story of the first LaRose in the family, one of a long line of family members with special gifts. She also weaves in the many secondary characters--Romeo, a ne'er-do-well with a grudge against Landreaux from their childhood; Maggie, the surviving child of the Raviches, full of anger toward her parents mingled with a need to watch and protect; the children in the Iron household; the reservation's elderly, many cared for by Landreaux. Throughout the novel, Erdrich gives an unblinking look at the best and worst of life on and around the Ojibwa reservation and even a shocking piece by Frank Baum (of Ox fame) calling for the annihilation of Native American tribes. Without over distilling, I have to say this is a story of redemption and family. Each character was so carefully drawn and revealed, their back stories making clear their present characters. What results is a haunting story worth reading--and reading again. After two and a half months at our new home, I have bookshelves. I spent yesterday unpacking boxes and trying to decide which ones earned a space, since I have a limit. I feel as if I were being reunited with old friends. Best of all, I am reaping a small reward for the time I spent packing the books. I went about the packing process methodically: Books I Want to Read Next, Good Books I Want to Keep, Shakespeare (2 boxes), music books, Southern authors, humor, art, photography, scrapbooking, books on the Holocaust and the Vietnam war, books of poetry (I won't say how many boxes). I have several boxes of my signed first editions, some of which I'd love to sell, some with which I'd never part. Packed in their own boxes, I have so many paperbacks, especially classroom classics. I was surprised at the number of duplications (in part because people who know me tend to buy me books for gifts). Most of them I have put aside for other book lovers to whom I will pass them along. I have several books from my high school days, with "Nancy Coats" written on the inside front cover. Since I also have small bookshelves in the rooms I have outfitted for the grandkids, I move books in there for them too--The Borrowers, the Little House books, Where the Red Fern Grows, the Narnia series, many of them books I read with my own children when they were small. I know so many people who read exclusively on eReaders now or depend completely on the public library. I do both, but I have an ongoing relationship with my books. It's nice to give them a little fresh air. I realize I've been missing in action here for several weeks. If you've wondered where I've been lately, I have a simple alibi: I moved mid-February. I haven't quit reading. Of course not. But I've spent far too much time unpacking boxes, along with a great deal of pleasant time exploring all there is to do in Nashville. Through my college roommate Susan, we were invited to join a supper club, and one of the members asked if I wanted to join her book club. (Picture me smiling.) During the time I was in Hickory, my book club was composed of people who had known me before joining the group. Some knew each other, but they all knew me. We made up our own rules (and very few of those) as we went along, so we were low on structure. On my first meeting with my new group, I arrived at the hostess's home in Franklin in a beautiful area of this charming town. I knew only Gail, and I had met her only twice, but I liked her already. The rest of the group was diverse. One former book club member returned after a long absence, so I didn't feel like the only newbie. A couple were from South Africa and have arranged a trip for some of the group to go there this summer. The book they had chosen for March was When the Moon Is Low by Nadia Hashimi. The story begins in Kabul, Afghanistan, told from the perspective of Fereiba, who loses her mother at birth and is raised by her rather disconnected father and a self-centered stepmother, who attempts to arrange a marriage for Fereiba that will be in the stepmother's own best interest. Nevertheless, Fereiba ends up in a happy marriage where she blossoms until the Taliban brings about changes that eventually shatter her happy home, leaving her no choice but to take her three children and to flee her home country. From this point, Hashimi moves back and forth from the perspective of Fereiba and her son Salem, forced to grow up quickly in order to help the family slip across borders into Turkey then Greece, until they are separated and have to make their way separately to England, where they hope to rejoin family who left while the Taliban's threat level was still low. This beautifully told story is a stark reminder of the dangers and challenges that so many refugees face while fleeing war-torn countries. As the daily news presents the current wave of Syrian refugees in terms of massive numbers, Hashimi reminds readers of their humanity. Just a couple of evenings before the book club met, I attended a concert by Abigail Washburn and Wu Fei at a local coffee shop. The show was free, but donations to Nashville International Center for Empowerment (NICE) were encouraged. This group helps refugees in the resettlement process, finding work and educations, as well as addressing health concerns. I was once again reminded of the power of literature to encourage empathy through individuals' stories.